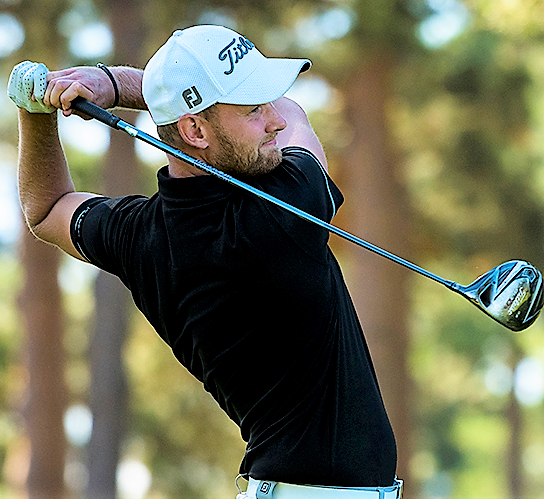 Todd Clements of Essex and Jack Gaunt (pictured above) of Staffordshire will meet in Sunday’s final of the English amateur championship after winning hard-fought matches at The Berkshire Golf Club today. They both won their semi-finals by one hole after an afternoon which included great golf, a weather delay of over an hour for lightning and a rules issue. The referee had to be called on the second hole when Clements’ opponent, Nick Poppleton of Yorkshire, realised he had a non-conforming club in his bag. He’d added it at lunchtime, planning a practice session, and forgotten to remove it – and the error cost him a two-hole deduction, going from one up to one down. He was three up after five holes and, for the most part, the score stayed that way until the 15th, which Poppleton (Wath) won with an eagle three. His lead was reduced to one hole on the long 17th where they both found heather off the tee. Clements eventually holed from 12ft for his par but Poppleton, from half the distance, slotted in a winning birdie putt. On the par three 18th, it was advantage Clements when Poppleton went through the green, into the rough, and chipped back a good 40ft past the pin. But the Yorkshireman rolled the putt straight in for his par. Clements held his nerve and two-putted for the half and his place in the final. His opponent, Jack Gaunt (Drayton Park). has fulfilled his first ambition with today’s semi-final win. He lost on the 18th in last year’s semi, to eventual champion Dan Brown, and this time he was determined to go one better. “Last year taught me a lot about keeping your head and not getting too bogged down thinking about past shots, but to try and stay in the moment,” said Gaunt. He played Somerset’s Tom Sloman (Taunton and Pickeridge), took the lead with a first hole birdie, was two up at the turn and looking comfortable. But by then Sloman had found his stride and with a great birdie two on the 10th he reduced the deficit to one hole and, after another birdie on 14, the match was all square. Gaunt came straight back with a winning birdie on the 15th and he also captured the 16th with a par after Sloman’s ball hit a sprinkler head and went long. But Gaunt’s lead was cut to one hole after he found the heather twice on the 17th and he had to par the 18th to secure the win.